a) 40,000 solar lamps were assembled, sold and maintained, over a period of 4 months. b) 83 tribal women, engaged as part of the project, are now able to earn Rs 5000-6000 per month. c) Based on the success of SoUL project, the ministry of new and renewable energy (MNRE), GoI has funded project to provide solar lamps to 70 lakh students. a) Irrigation potential increased by 7,400 Ha, with increase in coverage under micro-irrigation by 28 Ha. c) Turmeric cultivation and processing at Tisopi has helped in taking turmeric from field to retail market. d) In Siata and Neotala villages strawberry cultivation is a commercial success. b) 33 new water structures were created under the scheme. c) Increase in gross agricultural area: 65,000 ha, including 2,500 ha of unused land which was brought under agriculture. a) 182 farmers were insured under the scheme, of which 54% are non-loanee farmers. b) Total coverage of insured area is 76 Ha, out of total cropped area of 21,257 Ha. a) 3,964 farmers were insured under the scheme, of which 97% are non-loanee farmers. b) Total coverage of insured area is 622 Ha, out of total cropped area of 18,782 Ha. 2. Jalna district of Maharashtra under the category of other states. a) 12,29,699 farmers were insured under the scheme, of which 77% are non-loanee farmers. a) 87,988 farmers were insured under the scheme, of which 98% are non-loanee farmers. a) 3 commodities, 50% of the commodities proposed in DPR, are traded on e-NAM platform. c) 70% of the registered traders (196) have participated in trade on eNAM platform. d) Total value traded on e-NAM platform is Rs 4.09 crore. a) 5 commodities i.e. 100% of the commodities proposed in DPR, are traded on e-NAM platform. b) 103 traders have participated in trade on e-NAM platform. c) Total value traded on e-NAM platform is Rs 77 crore. d) More than 90% transactions at APMC are cashless. a) 135 villages were electrified during the period of consideration. b) 24 hours power supply is available during the normal season. c) Faulty meters are generally replaced within 7 days. a) 12 villages were electrified during the period of consideration. b) 98,189 sanctioned BPL households were electrified during the period of consideration. c) Hours of power supply In rural areas is 16 to 18 hours per day and in urban areas is 22-23 hours per day. 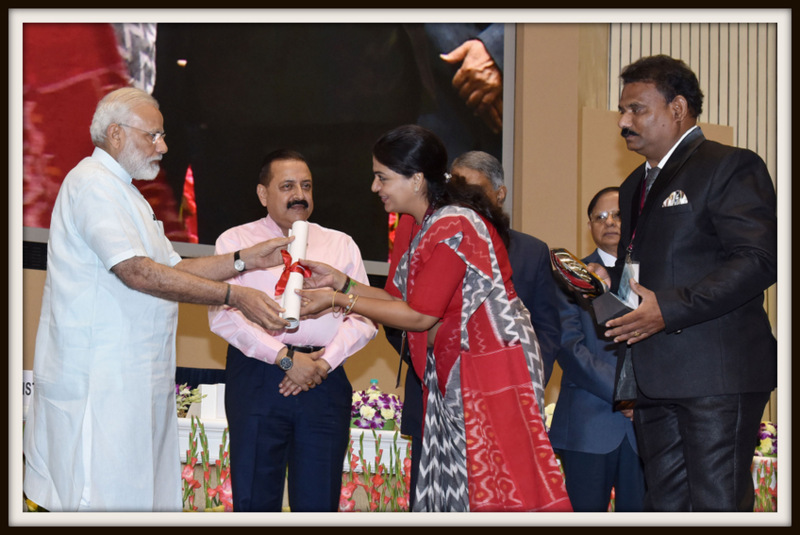 The term 'Civil Services' remains confined to IAS who enjoy immense statutory and financial powers to implement the award winning schemes and initiatives. The other civil services thus are greatly discriminated and find no level playing field. e.g. solan which was awarded by PM 70% traders of registered 196 have participated on e nam (meaning 1 trade at least?) while traded volume is 4.09 cr i.e. 4 lakh per trader which means hardly one or two deals per trader. Anantpur claims to have used drones for monitoring? Seriously why? The Civil Services Day on 21 st April is annual ritual celebrated year-after-year. For the past two years, this has turned into a two-day extravaganza as against one earlier. I attended the first Civil Services Day on April 21, 2006. Attendance was compulsory. Usual rhetorics, sermons by dignitaries. All very de-motivating, uninspiring. Sheer waste of public time, public money with no value addition to their attitudinal change in “rededicating themselves to the cause of citizens and renew their commitment to public service and excellence in work “. 5-star coffee/ tea and lunches have always been the star attractions. A rare opportunity for Junior bureaucrats to introduce themselves and shake hands with the high and mighty. The hungry bureaucrats fell over each other to have their picks. The 2007 event was far more boring. A repeat of 2006. Consider the 2017 event. I saw the video- clipping. PM Modi presented awards to some 500 civil servants this year as against 100 last year.Is this an achievement, a “ quantum leap “. What were the shortlisting criteria? Who were members of the Jury? How could all awards be monopolized by the elite Service? Are they the best brains in the country? Was it a fair competition or just the one based on pick-and-choose, arbitrary and discretionary powers. The anguish expressed in these columns by other Services, is justified. A great snub to these less- fortunately- circumstanced services like the IFS, ICAS, IRS, IDAS, Railway services, IFoS etc. Selection of theme,it appears, was a subtle conspiracy to highlight the achievements of the elite Service . PMO will have much to explain. Let it upload all facts in public domain including the total expenditure incurred on the mega event.A drain on tax-payers money. Several RTIs may be in the pipeline. Let us introspect : Whether such annual celebration is worth continuing with biases, discrimination against other Services , heavily tilted towards the IAS. Mollycoddling of civil services, should be banned.